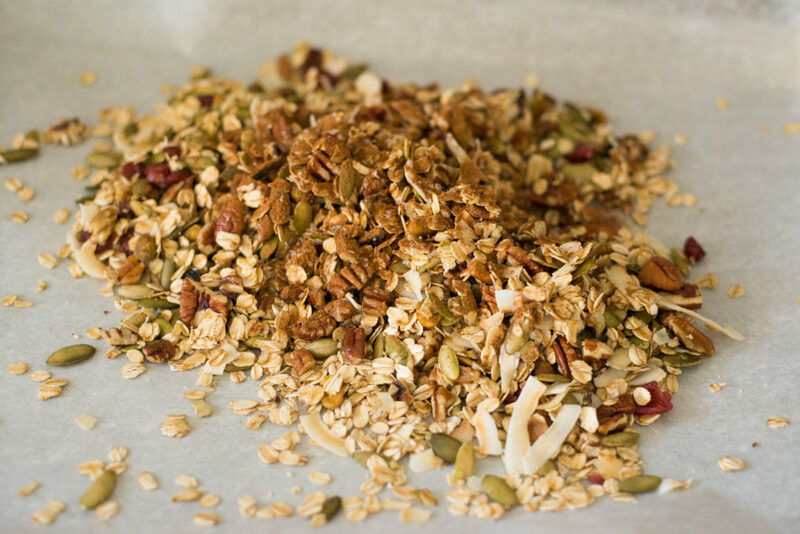 I have a love affair with making my own granola. 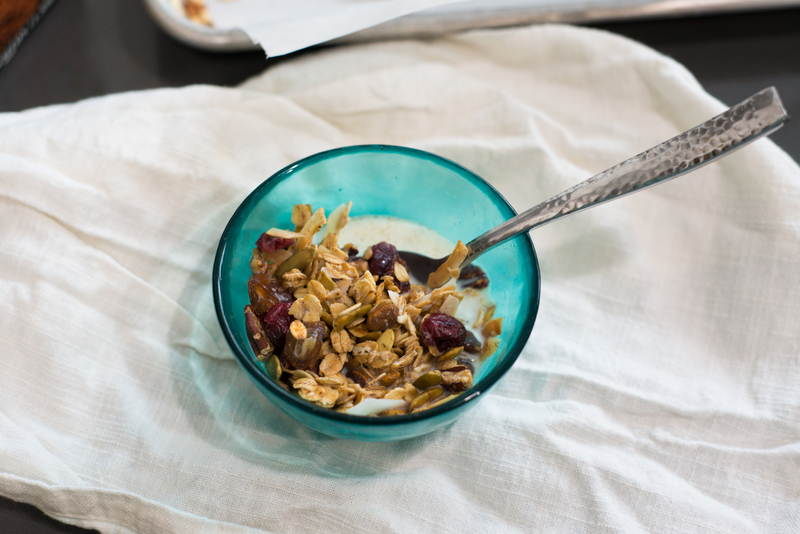 I just can’t imagine a better breakfast than granola and some milk or yogurt. I make it a little different every time, and I always find better and more interesting combos. This time, I found some awesome (and cheap!) dates from TJ’s and I knew I had to add them to my latest mix. 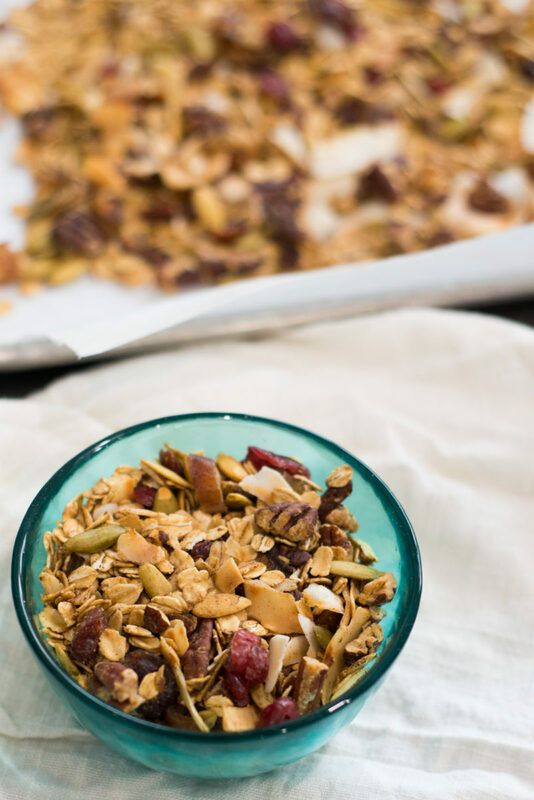 There’s something about homemade granola on a weekday morning that feels like self-care. Call me crazy, but I always thank my past self for taking the time to make something delicious for rushed mornings. I’ve been feeling rushed and nuts for a few weeks (guys, we now have two kittens and a puppy and I have to literally sit on the floor and watch them eat breakfast so they’ll play nice) so getting up and seeing granola on the counter calms my heart and mind. You can make this with whatever nut you like, and whatever seed you like, and some dried sweetness. Make it exactly like I make it, or change out everything – it’s all in the ratios. Balance oats with sweet, nutty, earthy…you get it, right? Pepitas are my jam right now because a) it’s fall so pumpkin everything and b) they’re so damn easy to add to all things for a boost of protein and fiber! Add them to your soup, your breads, your cookies, your granola, have a handful for a snack, throw them in your stir fry. They are good in all the ways. Preheat oven to 250. Chop pecans. Mix together with pepitas, oats, pumpkin spice, salt, maple syrup, and coconut oil. Cook for about an hour, tossing every 15 minutes or so. 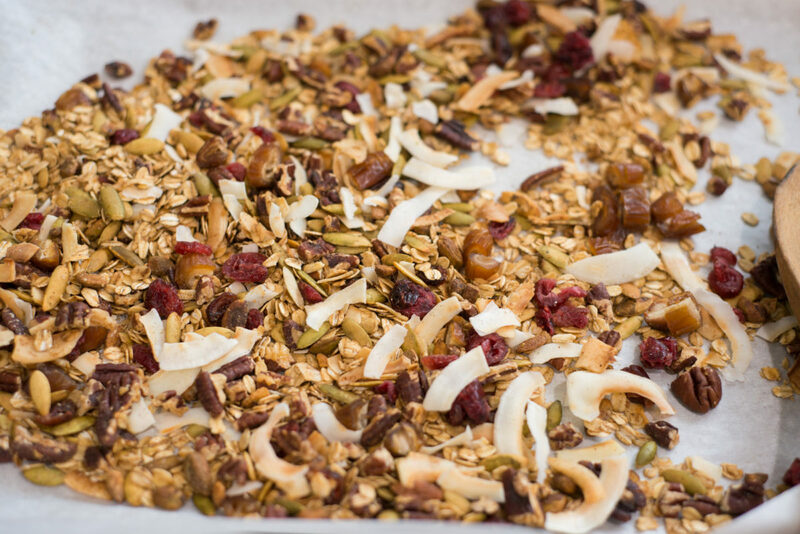 When toasty and browned, remove from oven and added cranberries, dates, and coconut. Serve warm or room temperature with milk or yogurt! Categories: Autumn, Baking, Breakfast Tags: autumn, baking, breakfast, cranberry, date, fall, fall granola, granola, maple syrup, oat, pecan, pepita, pumpkin spice, salt, trader joe's. permalink.